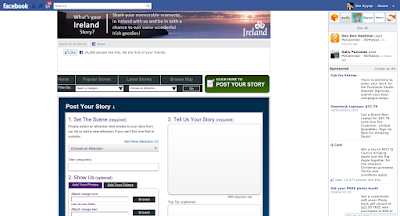 The headline read, "Your Ireland Story" and the tag-line was, "Win a Christmas hamper just by sharing your Ireland story." By itself, the headline is a curiosity headline. Compared with other types of headlines, it is not as effective in grabbing the reader's attention. Remember, people scan for keywords. The headline announces what the ad is about. If the headline fails to catch the reader's attention, then the tag-line, no matter how effective, is going to be of no use. Using "Win a Christmas hamper" as the headline is a better headline than "Share your Ireland Story", but it's still weak. It implies that the reader will participate in a raffle or contest before they will gain anything. Since the ad brings the audience to the facebook landing page, the only element the copywriter can change was the tag-line, "Win a christmas..."
Let's say I got curious and clicked on the ad, let's see what is in store for me. I now have its facebook fan page. It took me a few seconds to figure out what the ad wanted me to do. As a reader, my eyes automatically fell to the left side of the page looking for instructions. Looking at the image above, what is the first thing that comes to your mind as to what you should do next? 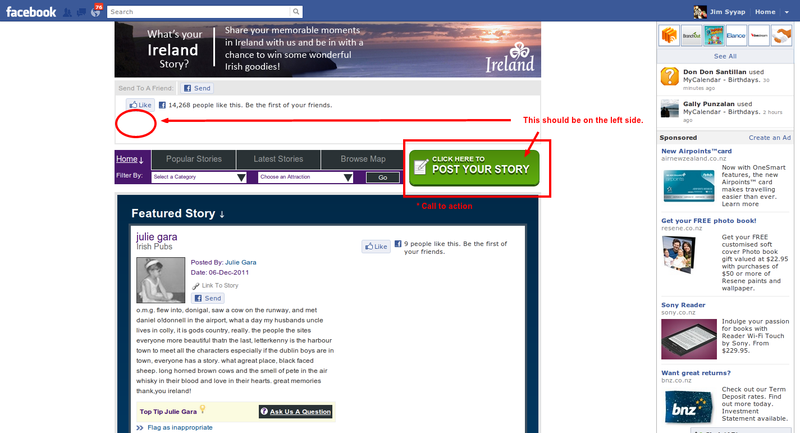 The green "Post your story" button should have been on the left side of the page where my eye will automatically land. Instead, it was on the right hand side. It's not bad, but to make it easy for the reader, I'd place that button on the upper left side of the page if I was the copywriter. 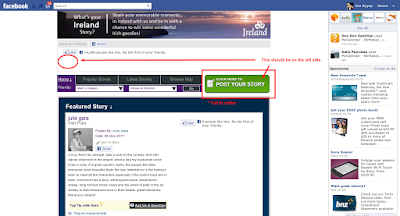 After I found the "Post Your story Button", everything else was straightforward. Write your story, post and (probably) wait for moderation. I did not go through all that, so I can't tell how the reader will win that Christmas hamper. If the campaign hinged on this one ad, I don't think they are going to get a good response rate to it. Why? It's not getting as much attention as it should. How then, will I fix this ad? It's not a killer ad. I'd say they won't like the response that they are getting, which is good.It's an opportunity to come up with a better ad. If they knew what they were doing, this is the B side ad of an AB testing. That means they probably have a second ad running alongside this one to see which ad pulls better. I am assuming that this facebook fan page has its own page URL. As copywriter, I'd change the page's title into something more catchy. Then work the other ad elements based on the ad.